This TrueStrike Ideal for Simulator applications that require a center hitting position. It is also designed for golf professionals, coaches and driving ranges where an academy application is required. It s the best investment for group coaching and is designed especially with all levels of golfer in mind. If you have any questions regarding the TrueStrike Academy Golf Mat, please give us a call, we would be happy to help you with any questions you may have. 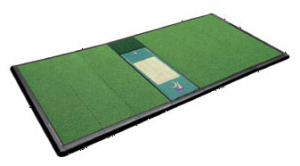 Write an online review on the TrueStrike Academy Golf Mat, and share your thoughts with others.